There have been some suggestions on here lately about using aluminum screen frames for the zero pass collector. I was wondering would it be strong enough to pull the screen taut enough? Also would the spline hold up in high temps. Would it hold the screen tight enough? What about the plastic corners? Could the screen be crimped instead of using spline? Also they do have metal corners such as these. Of course if you go frameless, then you won't have to worry about this. I think crimping would work, provided there is a way to hold the screen in place while it is being crimped. The usual spline might prevent crimping. Suggestions? Thanks for the link on the metal corners. In my experience the metal frames if over a couple feet long will bend inward under the tension of the screen. I've watched professionals and they bend the frames outward first to compensate for this, and then put them in a jig. Otherwise you'll need a brace of some sort. Willie is right. The hollow metal screen frames can't handle very much sideways tension at all. On a vertical collector, or window, I thing the tension would be okay, but a collector like mine, with the tilt angle, I don't think it is going to allow for a consistent screen gap if the screens can't be pulled tight enough. But if you did use screen frames, keep them smaller, such as 4x4, instead of 4x8. 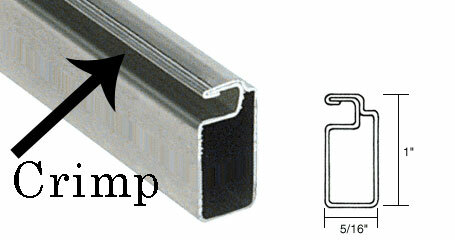 If you have a patio door, which is smaller than 4x8, check the tension. There is a looseness that likely will always be there with aluminum frames. The metal corners above are pricey. I think you could accomplish nearly the same using 2-3 metal corner braces stacked on each other to create the proper thickness. A little grinding and/or J-B Weld and your corners will be much more sturdy. As far as crimping the spline groove, I think you would still need something in the groove to help hold the screen in the groove. Even if the spline, jute, or twine is snug, it might loosen. A dab of epoxy or a little crimp here and there might help to hold the screen in the spline groove. Ideally, you won't have too much heat building up inside a collector. On those occasions that things really overheat, it's likely because of the lack of airflow. In which case you have bigger problems. I do like the screen frames, but will likely go with frameless on the next collector. But I also like the simplicity of screen frames, if the above issues can be resolved. But one thing is certain, I won't use wood frames for the screens. They can warp, and add a lot of unneeded thickness to a collector. But then again, if space is not an issue, wood frames are a cheap and easy solution. Those corners are a pack of 20. You would have to build quite a few collectors to use them all for sure. I really don't feel comfortable with the aluminum screen frames either. Now if there was a way to use porch screen extrusions to hold the screen and act as part of the frame... Expensive though. That doesn't solve the frame strength problem though. Maybe a C-shaped channel along the inside edge of the collector box that supports the screen frame from all sides. But Bert's build is vertical, so sagging won't be as big an issue. With my wooden-framed screens I have no noticeable sag in the screens after two heating seasons. There is some minor twisting of the frames. If the frames were attached to the collector box, that would likely not have happened. You'd need at least 16 corners, if your frames are 4x8. Twice that if they are 4x4. Although you could possibly attach the back screen to some support stand-offs on the back of the collector for additional support. If you consider frameless, you do need strong attachment points for both one end of the screen that is attached to the end of the collector and the other end which is being pulled taut. How do you get 16 corners out of two screens? Suppose one were to go frameless with just those aluminum screen frames on the end. Drill through them edgewise to take a # 10 or so self-tapping screw. Run long screws through from the outside of the collector box. You could adjust tension with a screwdriver. Your idea for using the screen frame along one edge is an interesting idea. I think you might need something more sturdy than only using the screen frame. You could add a reinforcing bar stock brace that covers the spline slot to hold the screen and spline in place. If you didn't want to drill through the side of the collector, you could always attach the screen frame/brace to a few springs attached to the end of the collector to add tension. Whatever works... I just got the idea from my experimental collectors, I hold the screen/cinefoil frames in place with screws from the outside. Speaking of which, is the rear air gap really necessary in a zero pass? Why not just lay the screen against the back?